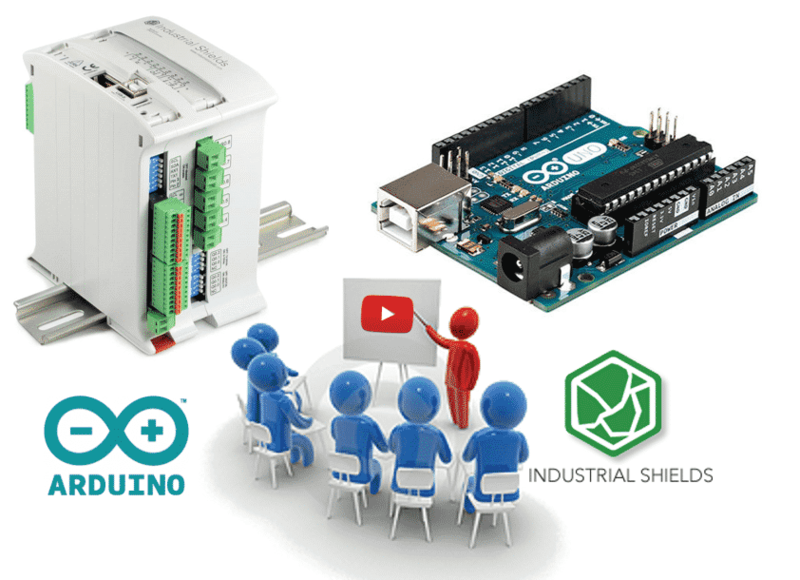 I imagine that you already know what Arduino is, so in this course, we will focus on how to use Arduino boards and Arduino based PLCs in industrial environments to execute projects 30% faster. Using different simple and free tools you will become a high-performance Arduino programmer, capable to develop an Arduino project. The time in an industrial project is money, so we are going to show you save 30% of your time. Check and evaluate the different variables and signals connected to the PLC with a graphical interface. Use examples already developed, so you don’t have to start from scratch. (Yes, examples! it is not necessary that you write the full code). There are many valuable examples to develop your projects). Use libraries for your standard functions. (Remember: For us, a PLC works like an individual Arduino board. Our PLCs use original Arduino boards inside it, so you can practice the examples showed on this course using original Arduino boards). Install the following material on your computer to start the chapter #1 next week. Using a simple graphical platform you can display the PLC status easily and in a friendly way. You can also use it as a SCADA in your project and you can integrate it into your projects as a Human-Machine-Interface. Simple, easy and free. We recommend using an Open Source platform called PROCESSING. (The Arduino IDE is based on this platform, so you will find it very familiar). Use the original Arduino IDE to program your PLC. Review the different examples from the Arduino IDE and avoid to have to start your project from scratch. It is necessary to select the Arduino board in the right USB port where the Arduino board is connected to the computer. To configure the different inputs and outputs from the Industrial Shields PLC is easy. You can also use the library from GitHub and forget the pinout checking. See how to upload the library from our blog. Using Processing it is available to have a Graphical Interface done easily and simple which let us monitoring and interact with the PLC and controlling all your installation. The Arduino IDE let us use libraries where calling our standard algorithms and develop a structured program. We encourage you to see the current version of the original Industrial Shields library from GitHub so you can see how the folders are structured. In the following chapters, we will see how to develop a library and how to call them using the Arduino IDE. (Remember: Industrial Shields PLCs are working as Original Arduino boards. Our PLCs have original Arduino boards assembled inside. Then, you can practice the course using an Original Arduino board). Industrial Shields library from GitHub. Arduino Leonardo or Arduino Mega (You also can use an Arduino UNO if you get it). (The devices used with the Arduino Mega and Arduino Leonardo assembled inside have been: From the Ethernet PLCs; the M-duino21. From the 20I/Os PLC; The Ardbox Relay ). Do you want to continue the course?...for free!!! If you are interested in receive the next chapters for free just fill the form. You will receive a weekly chapter to program Arduino on industrial uses. Have you ever used PLCs/Controllers?